This post is primarily a response to the article on the BART Strike from The Nation that seems to be making the rounds on Facebook, Twitter, and all of the other blagoblag echo chambers. I've adopted this post from a Facebook message conversation I had, so it might be a little strangely-phrased. I apologize for any inaccuracies, I do not speak for my employer, and all of that necessary prelude. I found the Nation article on the BART strike this week frustrating and inaccurate and, because someone is wrong on the Internet, I had to write a response. The BART strike is one of the more visible bits of organized labor work in the last few years, and it makes me embarassed as a stereotypical liberal that those defending to it are doing such a bad job. If the union is striking for more money, then say that. But don't misrepresent statistics to justify it. And if the union is striking for other reasons, then it would be lovely as a Bay Area resident and news-reader to know exactly what those reasons are. This well-disseminated article is nothing more than one-sided, poorly-researched editoralism masquerading as news. My understanding (from the ballot measure about BART funding last year) is that people who assume a budget deficit assume healthcare costs keep growing at the current rate, and the people who assume a budget surplus assume that healthcare costs stop growing. The BART audited financial report shows 9% Y/Y healthcare cost increases. Of course, it's probably not that simple. My reading of the BART financials is that they maintain a balanced operating budget and they are facing a deficit in their capital budget. But the Nation article doesn't even slightly touch on that; it just quotes the union spokesperson (who is emphatically not an unbiased source). 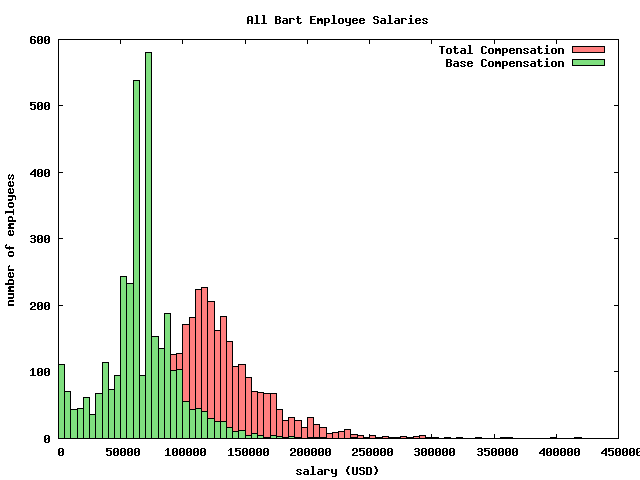 I'd love to know more about the specifics of BART financials. It comes up in ballot questions pretty regularly, and nobody ever does a good job of presenting quantitative data about revenue and cost estimates, nor about the difference between BART's two budgets. Then there's the compensation issue. 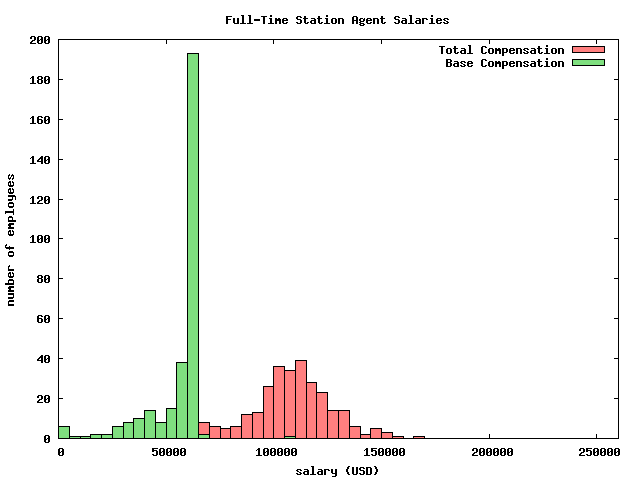 The Nation article quotes this SF Examiner article as saying that BART employees make a maximum of $62,000 a year. 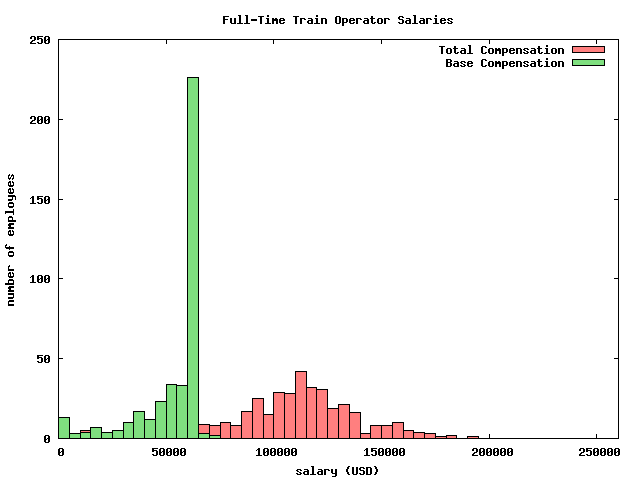 Firstly, that particular article clearly states that much of the expected compensation of BART employees is in overtime, which averages $17,000 per year for train operators. So why is the Nation ignoring that in their linkbait? Who knows. The word "overtime" doesn't even so much as occur in the article. I would love to see some explanation of her numbers from Ms. Kilkenny. Citing either just the union spokesman or just the administration spokesman doesn't actually provide any information and seems particularly lazy when the exact figures took me a whole couple of minutes to look up and plug into gnuplot. The thing that most interests me in this article is the assertion that one of the primary BART employee concerns is safety. That seems both legitimate and underreported in the mainstream media. So I would love to find out more about it. What does The Nation say about the safety issues? BART refuses to even discuss the issue of safety for workers and riders in negotiations. No response is actually given from an independent source, and the safety measures include the ever-useful "etc" (side note: if you're a journalist and you find yourself using the word "etc" in a major article, please reconsider your career choices). Sorry to rant, but one-sided articles getting this much press, in either direction, frustrate me. There are a lot of legitimate labor issues in this country. The New York times had an excellent article yesterday about minimum-wage employees being forced to send a tithe of their below-poverty-line salaries to Chase or Citibank for "prepaid debit card" pay from major retailers. So where are the fry cook unions to protest that? Two Septembers ago, workers at the Grand Hyatt hotel here in San Francisco struck, and there was almost no news coverage, no outraged articles in liberal blogs about that. 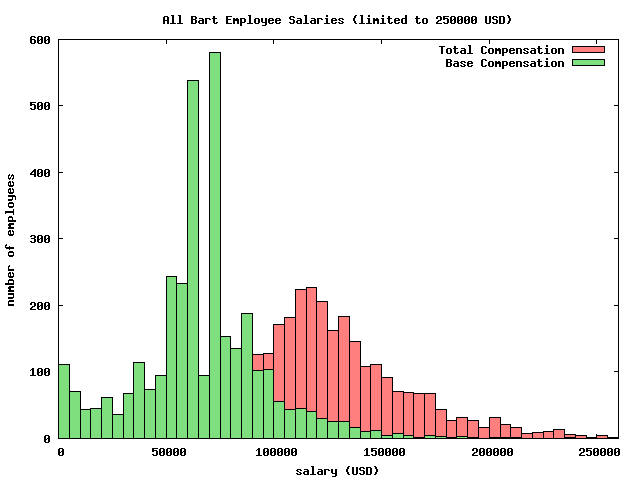 Hell, what about the fact that I get paid substantially more to press 104 keys than BART employees do to run trains? Let me be absolutely clear: I support unions, both for public and for private employees. And I support their right to strike to demand fair working conditions. There are a lot of problems that organized labor can solve! But hurting the already quite-tarnished public image of organized labor with an strike like this by the relatively-well-off BART employees seems like a waste of good will and yet another bullet point for libertarian types (both in the Republican party at large, and those closer to home sitting in their Silicon Valley estates) to pull out when suggesting that the United States continue its march toward banning unions.